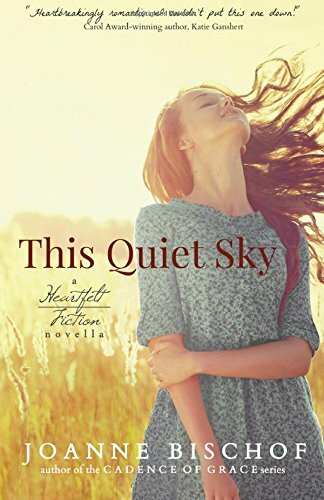 This Quiet Sky by Joanne Bischof is quite simply a beautiful story. It is a Christian historical romance set in 1885. It is a beautiful gentle love story and one that definitely went straight to my heart and soul. This Quiet Sky is told in the first person from the point of view of sixteen year old Sarah. Sarah is the new girl at school and is sat by seventeen year old Tucker, so he can help her with her algebra. No one wants to sit by Tucker. Tucker is ill. No one can catch it but all the children avoid him. All except Sarah. This Quiet Sky is the story of Sarah and Tucker’s friendship. Theirs is not a superficial friendship. It is deep and lasting. It is a bond that will not be broken. The novel is also about God. Joanne Bischof shows how Christians can be ‘real’ with God. They can tell Him their dreams and they can be honest about their feelings. “I don’t feel like praying right now… if I could look God square in the eye… I would tell Him how angry I am at Him.” Being angry at God doesn’t mean Sarah doesn’t love Him, it means she feels so comfortable in her relationship with Him that she can be truthful about her feelings. Likewise Tucker has been angry at God, but not anymore. He recognises that God is a God who gives “He’s still giving… He’s giving me today.” Joanne Bischof shows in the novel how important each day is. We cannot take our days for granted. “This isn’t all about life… or all about death… it’s about living what you can live for. What God gives you the time to do.” We should take each day as a gift and use it wisely. Throughout the novel runs love. There are different types of love. Love is what makes life worth living. Love can simultaneously bring a smile to your face and a pain in your heart. Joanne Bischof writes in such a way that I could ‘feel’ the love in the novel. I have to say that This Quiet Sky is a most beautiful novel. I could not put it down and read it in one sitting. As it is written from Sarah’s viewpoint I ‘felt’ her emotions throughout. It made me laugh and it made me cry; it gave me hope and it spoke to my soul. I adored it. I can only urge you to try it for yourself – download This Quiet Sky today – grab a coffee and a box of tissues and settle down for a totally beautiful read.